Is it easy to call a cab from Seoul to Ganghwa Dolmen? I'd like to avoid around 5 hours in buses when it seems that a 1hr ride with traffic would be enough. Plenty of Bus options from Seoul that take about 1hr 30min. From Ganghwa Bus Terminal, its a short bus (or taxi) ride to the largest dolmen. All said probably a bit less than 4 hours of travel time. Even with a taxi its still going to add up to a bit less than 3 hours. The question then becomes is paying potential 60,000 won or more (one-way) worth saving 1 to 1.5 hours of driving time? If you did want to save time, a better option may be to get the bus from Seoul out to Ganghwa. Then get a taxi from the local bus station out to the Dolmen, get it to wait and take you back to the bus station. It will be a much cheaper option, and the bus into Seoul took roughly the same amount of time as a taxi would as it mostly was on a Motorway if memory serves me correctly. Just as a note whilst this is the name of it, it isn't really a Bus Terminal as you may expect, rather just a bus stop on the side of the road. If I remember correctly it was the one here in front of CasaVille/ Lotteria. Korea has the best public transport i have seen, and the people are very helpfull. It's rare to know this amount of detail in any state parties nomination plans. How efficient for the world heritage traveller that Korea offers 12 WHS in a relatively small area, and time permitting you can ensure you visited all potential new WHS up until 2023! To be honest, probably longer since some of these nomination dossiers are bound to fail, but will undoubtedly make at least one additional attempt (example: Hangyangdoseong). For what its worth, I believe after Korea's 2 recent withdrawn nominations the Cultural Heritage Administration will be successful with 3 inscriptions over the next two years. I am not so optimistic however about Korea's nominations between 2020 - 2022! Thanks to the priceless information from this website and winterkjm's great pointers, I managed to visit all South Korean WHS and the first 3 tentative WHS according to the nomination plan + Suncheon's Tidal Flats over 18 days. Overall I was pleasantly surprised by this country's WHS and although there aren't incredibly outstanding individual sites, I would rank all sites as good to very good sites which are worth visiting and all possess outstanding value, be it niche or universal value. I hope to find some time soon to write my reviews and sort all the photos. News for Korea's world heritage program, 2019. This likely pushes back some of Korea's nomination submissions a year, yet its unclear if the Tidal Flat dossier can be improved in-time for 2020, or if this nomination requires more time? 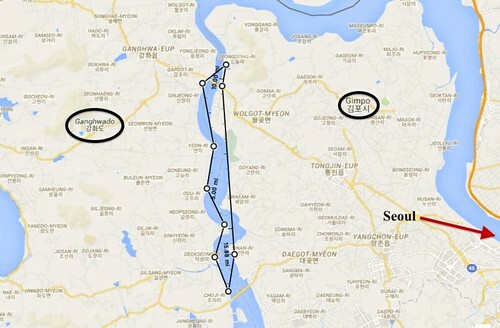 I think Hanyangdoseong, the Seoul City Wall may have priority over the Tidal Flat natural nomination. Firstly, because it was withdrawn for 2017 and its a relatively strait forward cultural nomination. A difficult pitch for another fortification dossier from Korea, but this (aspiring) nomination is interesting. Unfortunately, its more interesting regarding the history rather than the actual remains, which are fine but nothing spectacular. I visited 3 or 4 of the sites and because so many world heritage travelers visit Ganghwa Island for the largest dolmen, it may be useful to have additional sites to include in your itinerary. As it stands, a whole lot of effort has been made to include this nomination on Korea's tentative list. Here is a summary of this serial nomination. I included a map below, because it would almost certainly be a central feature in the sites OUV. My photos of the property can be viewed HERE. One of the neatest realities of this nomination, if inscribed, Korea could easily develop a small ferry/boat system that allowed car or bus travelers who visit one site to then travel by water to the remaining component parts. Ultimately, visiting these sites would be a much more enriching experience by water! From the Northernmost fortification to the South, its only 12 kilometers. OMG! I have been there while I went to see that dolmen site on Ganghwa island. By some unknown reason we told the taxi to go to bus station but our taxi took us to visit the fort near the bridge from mainland instead and told us he want us to visit this place at least 30 mins! I remembered that the garden around the forts and the view were quite nice.